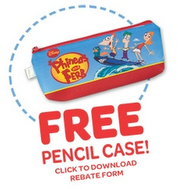 Get a FREE Phineas and Ferb pencil case back by mail when you purchase 3 Band-Aid products. This should pair nicely with a drugstore deal at some point and would make a great stocking stuffer. Get more details on the products included and print your rebate form here. This rebate is valid through 12/31/2011.